The problem with these promotions is that they are fraudulently using Dr. Oz's name. Dr. Oz doesn't sell any dietary supplements, you see, and he doesn't endorse specific brands or products. After sending numerous cease and desist letters to the scammers to no avail, Dr. Oz jumped on an airplane with his camera crew and drove to the scammers' place of business to confront them on camera! Click here to watch the exciting segment yourself, which almost reminds me of an episode of COPS. Dr. Oz doesn't hold back, either. He marches right through their offices and warehouse and even grabs video of the people fleeing on foot. Truly, this is one of the most exciting Dr. Oz moments in history -- and one of the most morally justified, too, in my opinion. ... all reportedly operating out of San Diego, California, marketing "Garcinia Cambogia" supplements. Like Dr. Oz, I'm sick and tired of the scammers and charlatans who use deceptive business practices to hawk questionable dietary supplements. In fact, I've helped expose several of these companies, including the fake Acai berry scams which ultimately resulted in an FTC crackdown and huge fines. While I'm a huge advocate of honest dietary supplements, superfoods and herbs, I have very little tolerance for people who think they can lie, cheat and steal their way to riches by exploiting the efforts of someone else. 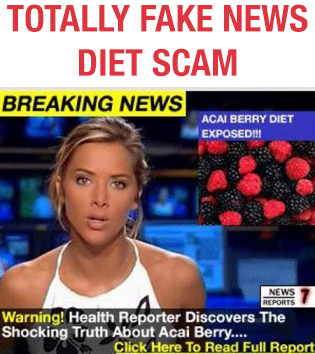 Check out the fake news Acai berry diet scam ad below: the attractive news model in this picture has been the subject in incessant image piracy and misappropriation. She's actually a French model who has been widely victimized by dietary supplement scammers, and her legal team has sent out hundreds (of not thousands) of cease and desist letters to violators. Natural News readers may not realize this, but we also go to great lengths to make sure scammers and cheaters don't get access to our website. Sponsors that we accept have to adhere to strict quality requirements. We even review the ingredients of their formulas and reject them if their products contain certain ingredients we don't allow. In fact, there's a lot going on behind the scenes at operations like Natural News to stop the scammers from duping the public. That's why I applaud this effort by Oz. I'm really glad he took the time and effort to produce this video report, and I think it's important for the public to be educated on the rise of internet scammers who exploit the gullibility of the public for their own selfish gain. These operators don't care about your health; they don't care about GMOs, or Smart Meters, or heavy metals... they only care about making a quick buck, no matter who they have to hurt (or deceive) in the process. Click here to watch the Dr. Oz video I'm talking about. The saddest part in all this is that products like Acai berry really do have many extraordinary properties (but they aren't a weight loss miracle, by the way). There do exist some honest companies that sell these materials, but the rise of scammers tends to discredit the entire industry of dietary supplements. It also feeds right into the FDA's desire to more aggressively regulate the industry -- a move which would suppress the availability of many useful herbs and products, thereby harming many Americans who currently benefit from these products. As someone who does have my own brand of dietary supplements, you'll notice that I routinely downplay any health benefits of these products. In fact, if you look at my freeze-dried Acai powder product page at the Natural News Store, you'll see that I don't make any health claims at all. But I do go to the extra time, effort and expense to test everything we sell for heavy metals, and every product sold under the "Health Ranger" brand is validated to be very low in such metals. There's no arm-twisting, no aggressive sales pitch, no auto-ship program and no, you don't see me stealing a picture of Dr. Oz to slap on the page either. My goal is to provide honest, pure, healthful products that nourish real people. It's a simple goal but also increasingly rare in an industry where the almighty dollar so often trumps any sense of ethics or values. I suspect Dr. Oz would share in the final message of this article: Do your homework before you buy supplements. Know who you're buying from. Steer clear of scammy-looking promotions. Ask the manufacturer if they've tested for heavy metals. Check out the reputation of the manufacturer. There are a great many honest, quality-minded supplement manufacturers in the marketplace today, by the way. NOW Foods, in my opinion, is one of them. GAIA Herbs is my favorite herbal product company. I just tested the Whole Foods brand of Ginkgo herbs, by the way, and found the heavy metals to be remarkably low. Whole Foods seems to have some solid quality control going on with their in-house brand (from what I've tested so far, anyway). Do your research and learn who to trust. And don't be duped by some fly-by-night operation that says Dr. Oz (or the Health Ranger, for that matter) has endorsed their product. Chances are it's a scam.